The major rebuilding of the church over the last two centuries inevitably led to the loss of some of the older memorials but it is perhaps more remarkable that so many have survived. The oldest memorial is an undated tablet low down in the north wall of the chancel to Philip and Margaret Lewston. It was inserted some time after 1537 possibly by Katherine Walter, their grand-daughter. Philip Lewston owned land in Wimbledon including the grounds where King's College now stands. He died in 1462. Katherine and William Walter are commemorated in the Renaissance tablet in the corner of the north wall. Another early gravestone lies under the carpet in the chancel with the inscription in Latin to Sir Richard Wynn MP who died in 1649. He was a friend of Charles I who married the French princess, Henrietta Maria. He became her treasurer and looked after the Manor House on her behalf from 1642 when she fled to Holland. This proved an onerous responsibility and may well have contributed to his death in 1649. On the south wall of the chancel are two modern brasses, the first of which commemorates William Wilberforce, the philanthropist and slave trade abolitionist. He lived at Lauriston House on the south side of Wimbledon Common and became a regular member of the congregation, sometimes being accompanied by the Younger Pitt who often stayed with Wilberforce. The second brass commemorates Walter Reynolds, Rector of Wimbledon in 1298 who later rose to become Lord Chancellor under Edward II and Archbishop of Canterbury in 1313. A stone in the nave is inscribed 'to the memory of Peter Shaw, MD Physician in ordinary to their Majesties George II and George III'. There are also stones to Ralph and Anna Wilbraham. who presented a chalice in 1665 and which is still in use today. 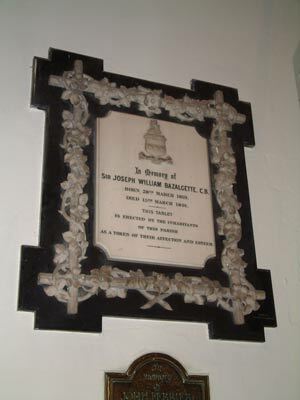 Most of the memorials in the church date from the 19th century and refer to influential middle-class people of the district. Some of their names are familiar to us now in the road names around Wimbledon. James Courthope Peache, John Ferrier, General Sir Henry Murray and Lady Murray and Sir William Beaumarice Rush all played an active part in the church. Sir Joseph William Bazalgette is also commemorated. He was the designer and engineer responsible for Putney Bridge and the Victoria, Albert and Chelsea Embankments. He is perhaps more famously known as the engineer who rationalised the decrepit and distinctly smelly London sewers in 1858, diverting the contents away from the River Thames thus probably avoiding a cholera epidemic and definitely improving the air quality of London. 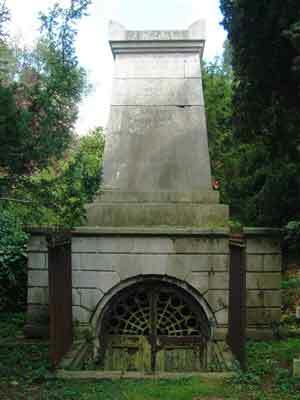 Bazalgette's mausoleum is worth a visit being right at the east end of the churchyard. It shows the twin functions of a tomb - to shelter the person's remains and to draw attention to the memory of the dead. There are steps down to the burial chamber which is protected by iron doors. A list of former Rectors is to be found in a window in the south aisle, the longest serving of recent years being Canon Henry Haygarth who was incumbent for 43 years from 1859 - 1902. He and his wife are buried in the churchyard. Just inside the west porch is a work of a leading early 19th century sculptor, Sir Richard Westmacott which shows James Perry seated, studying a bust of the famous Whig statesman Charles James Fox. Perry was owner and editor of a radical newspaper, the Morning Chronicle and owned a corn mill on the Wandle. The work was commissioned by his friends 'in testimony of the zeal, courage and ability with which he advocated the principles of civil and religious liberty'. The most recent memorial located in the window to the north of the pulpit is to Kathleen (Kitty) Godfree who died in 1992 and Leslie Godfree who died in 1971. Separately and together they won at Wimbledon, the ladies singles (twice), the mixed doubles (twice, once together) and gentleman's doubles. Kitty also won Olympic medals and Badminton titles. A book of remembrance was donated in the 1960's by Edward and Sarah Wates and inscriptions can be entered for those whose ashes are buried in the garden or who have a close connection with the church. These include a number of the Bazalgette family and also an inscription to the memory of Lewis (Lew) Alan Hoad who died in 1994 and who married J. Staley at St Mary's in 1935. He was twice Wimbledon Champion in 1956 and 1957.